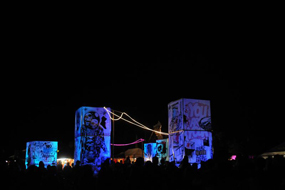 Splendid is seeking fearless young and emerging artists for two weeks of bending artforms and collaboration to create new works for Splendour in the Grass festival. Splendid is open to young and emerging artists (under 30 years old or in the first 5 years of their practice) who work in the visual arts, theatre, dance, design, installation, architecture, digital media, sound, text, community arts and other creative pursuits. Kristy Ayre, Splendid 2009 Artist. Applications due: 5pm Tuesday 6 April, 2010. Apply now for the opportunity of a lifetime. Splendid is&nbsp;extremely pleased to announce that&nbsp;triple&nbsp;j broadcaster and author, Craig Schuftan, will be joining the Splendid Curatorium team. The Splendid Curatorium is responsible for selecting participating artists and also determines which works are commissioned for the Splendour in the Grass festival. Craig is the author of The Culture Club (2007) and Hey! Nietzsche! Leave Them Kids Alone (2009), and has been presenting The Culture Club – a radio segment about the history of art and ideas in rock and roll – on triple j since 2002. The Edge, the State Library of Queensland’s new digital culture centre, launches on Friday 26 February. 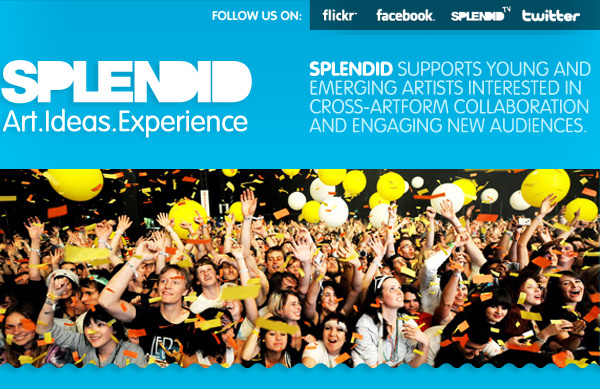 The Edge is joining forces with Splendid to create some mobile magic in July at Splendour in the Grass 2010. Over the opening weekend The Edge is holding a series of informal talks and discussion panels featuring experts in a range of areas from all over Australia and the world. Join Splendid Artists Dominic Finlay-Jones and Alice Lang with Splendid Producer Carli Leimbach from the 2009 Arts Lab to discuss their experience of the Lab and illustrate how Splendid has not only influenced their arts practice but kick started their careers. If you are based in Brisbane come down for a taste of Splendid. It could become the opportunity to meet your next best friend and collaborator. Art Month Sydney is a new month-long festival from 1–31 March 2010 that celebrates the vibrancy and diversity of Sydney’s thriving visual arts scene. The Art Month Creative Collaborations series explores the ways in which visual artists inspire, cross-pollinate and collaborate with people working across a range of creative industries. Join Splendid 2009 artists and provocateurs at ART + FESTIVAL: SPLENDID ARTS LAB. Splendid Artists Mickie Quick, Carl Scrase, Dario Vacirca, Mish Grigor and Carli Leimbach from the 2009 Arts Lab will discuss their experience of the Lab and illustrate how Splendid has not only influenced their arts practice but kick started their careers. Friday 26 March. 6 p.m – 8 p.m, $20. artist perhaps? 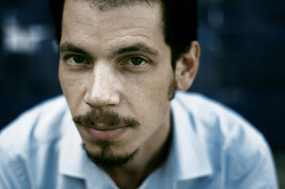 A musician or writer? Or do you know someone who is? 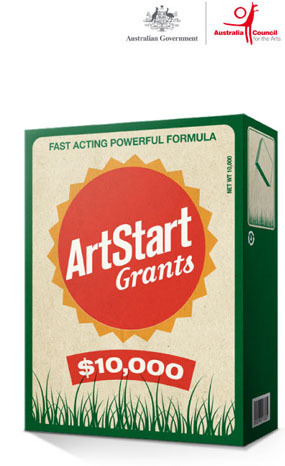 Here’s something you’ll want to hear about – a new type of grant from the Australia Council for the Arts called ArtStart which is designed specifically to help new artists get up and running. earning an income from it. you’re a final year creative arts student, you can. 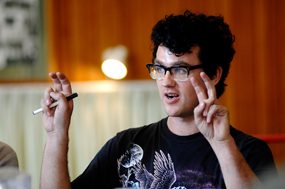 Are you a creative young Australian determined to make a career in the arts? A new program to support the arts leaders of tomorrow has been launched by the Australia Council for the Arts. 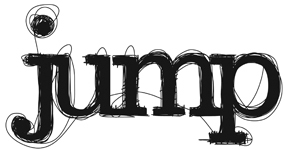 JUMP is a national mentoring program offering young and emerging artists the opportunity to develop a one on one relationship with an experienced professional in their chosen field. Get access to project funding, skills development, online profiling, and creative showcasing opportunities, and connect with industry nationwide. Applications close Friday 26 February 2010. Splendid 2009 artist Alice Lang is exhibiting in Crossing Over at Firstdraft gallery, Sydney. Crossing Over explores the space that exists in between the physical and non-physical body. Examining sensory experiences, ghosts that linger in the air as scents or as bodily residue in second hand sheets and clothes. 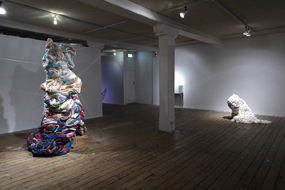 Jumper pod is a large-scale sculptural work made from second-hand jumpers that are hand sewn and stuffed in a repetitive, intuitive, labour intensive process, allowing the materials to drive the formation of the work to grow organically. The resulting sculpture is a hybrid object/organism whose final form references both foreign and familiar bodily elements to create tension between the familiar and the unknown. Firstdraft, 116 – 118 Chalmers St, Surry Hills. Next Wave and Tasmania’s Museum of Old and New Art (MONA) have teamed up to present a gigantic billboard in the heart of Melbourne, featuring work by Splendid 2009 artist Lauren Brincat. 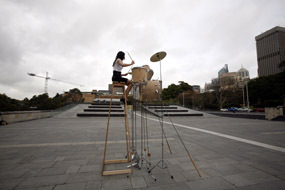 Drum Riser (2007) is part of a new Next Wave/MONA project that that involves the co-commissioning of a major new work by Lauren. This new work will feature in both MOFO, MONA’s 2010 Festival of Music and Art in Hobart this January, and in the 2010 Next Wave Festival, here in Melbourne in May next year. now until the end of February 2010 at the corner of La Trobe and Queen streets, Melbourne. Splendid 2009 artist Carl Scrase has been commissioned to shower people with flowers that he has hand picked. Carl has been picking flowers almost everyday; setting out into the world to notice what is in bloom, where the sun is in the sky and how he is feeling at that particular time, on that particular day. 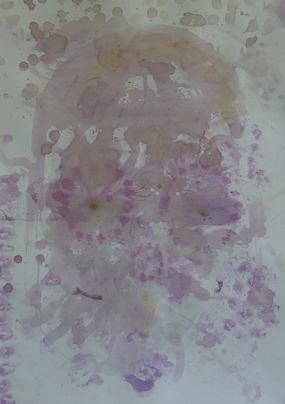 The artist then returns to his studio eager to paint with the inks squeezed from petals and experiment with what marks different flowers make when pressed against the paper. He gathers up the petals that don’t get used, dries and stores them, all in the hope that he will be able to distribute them through grand public gestures at some time in the not to distant future. You can&nbsp;witness these public gestures by&nbsp;Carl at the&nbsp;opening of Art Month Sydney on&nbsp;March 3, 2010 and at the Melbourne Food and Wine Festival in late March.